When it comes to increasing the satisfaction of the Collective, we have identified two interrelated areas in most need of improvement: better communications about events, and and increasing general awareness of the Brockton brand. With better communication, more inclusiveness and proper event notice, we hope to increase participation in Brockton events — 58% of members have attended or played active roles in our past functions. Those who have had the chance to participate tell us that they had a positive experience, as almost all (92%) would recommend the Brockton Collective to others. Members want the opportunity to get together in real time and space: they want more in person networking events, workshops and exhibits. We did glean from the the comments, that there is some interest in forums, workshops and education. In terms of committee participation, there is a great deal of ambivalence: while 20% of those surveyed report that they would be willing to join a committee, 53% said that they might be interested in becoming involved. We hope to encourage members to become involved at the committee level, to help us shape the collective’s governance, which should be member driven, since collaboration is at the core of what makes Brockton a ‘collective’. Please check out the committee enrollment here, as we will be resuming committee assembly in May 2016. The Brockton will also begin to develop tailored solutions for membership (which is temporarily closed) and aims to launch new options shortly. The survey revealed that 53% of members are in support of an “a la carte” system, while 40% favour of a tiered system and there was little to no support for a flat rate system. The Brockton Community has expressed that they are open to such services as a creative agency and an online magazine (93% in support of both). These are currently under development. 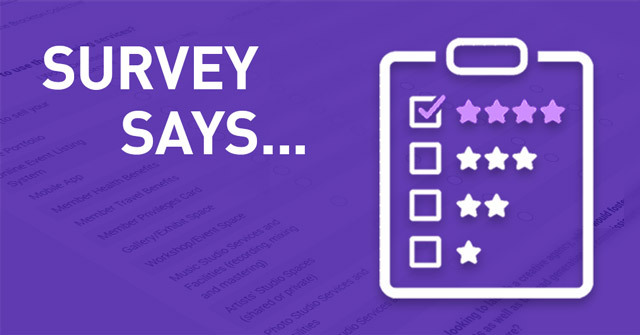 The implementation of the creative agency and the online magazine will help to satisfy what the survey revealed as the community’s three most pressing priorities: Showcasing, Representation, and Networking. Based on all of your valuable input, and what we’ve outlined here, The Brockton will be publishing a “road map”. This will clearly outline new initiatives, services, and offers. Also included will be the respective estimated implementation dates. By the way, we are keeping the survey open. So please share and take the time to fill it out, if you have not done so already: Artist Feedback Survey.